A group of Shetland ponies has been given "grazing rights" in the grounds of the world's largest satellite earth station in Cornwall. The environmental experiment by BT and English Nature is being carried out among the giant dishes at the 160-acre Goonhilly Earth Station on the Lizard. The animals are being used to control some of the complex's luxuriant heathland vegetation. It is designated as a Site of Special Scientific Interest. It is also part of the Lizard National Nature Reserve. 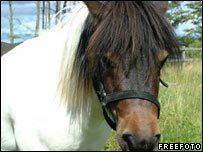 BT engineer Roly Haslam, who has played a leading role in the introduction of the ponies, said: "We have arranged with English Nature for four ponies to be allowed to graze on the site for a trial period of up to eight weeks so that the vegetation can be controlled naturally, rather than by mechanical means. "So far, they've done a great job. 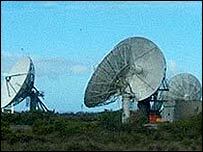 The four ponies - Thelwell, Bell, Flaming June and Heather - have been grazing in the shadow of Merlin, the largest dish at Goonhilly. Merlin, or Goonhilly 6 as it is known operationally, has a diameter of 32 metres, weighs 395 tonnes - and carried the Live Aid Concert in 1985 to more than 2bn people in about 100 countries. The station and the surrounding Goonhilly area are home to some of the rarest plants in the UK, including the Cornish Heath and Fragrant Orchid. More than 60 dishes at Goonhilly send and receive television pictures all over the world, while simultaneously handling thousands of international phone, fax, data and video calls. When it opened in 1962, Goonhilly was one of the first three satellite earth stations in the world.